Brand: Daedalus Lift & Access Equipments Pvt. 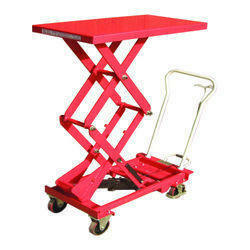 Ltd.
We are highly acknowledged organization engaged in presenting a remarkable range of SS Hydraulic Scissor Lift. These lifts are equipped with adjustable trap prevention safety trip bars. 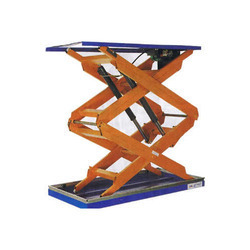 Widely demanded their operational fluency, ease of operation and safe usage, the offered products are highly popular in the market. Hydraulic Pump: High pressure hand pump (Dowty Make) with release valve for smooth lowering. Hydraulic Cylinder: Two thick walled honed tube cylinder. Piston: EN-8 ground and hard chrome plated piston. Seals: Polyurethane seals with back ring.